ACP is available as an injection or as 10mg tablets and the active ingredients is acepromezine. It is used as a mild tranquiliser or sedative for dogs and cats. It is no longer licensed for use in horses. ACP produces a mild to moderate sedative effect. Increasing the dose will not usually cause deeper sedation, but will instead make the sedation last longer. ACP also has some anti-emetic, anti-histamine and other effects. The injectable form is available for use by veterinary surgeons. Pale yellow biconvex tablet, approximately 6.5 mm in diameter, scored on one side only. Anaesthetic premedication: Following acepromazine administration, the amount of anaesthetic dose necessary to induce anaesthesia is considerably reduced. This reduction is approximately one-third of a suitable induction agent. Tranquillisation: Acepromazine tranquillisation (ataraxy) involves a modification of temperament which is not associated with hypnosis, narcosis, or marked sedation. This is achieved with low doses of acepromazine. Sedation: At higher dose rates acepromazine is a sedative. Travel Sickness: A dose of 1 mg per kg given orally a quarter to half an hour before a light meal is effective in the prevention of travel sickness. Idiopathic vomiting may be controlled by acepromazine. Do not use on a long term basis in individual animals. There are no known special warnings. Acepromazine is hypotensive. Particular care should therefore be taken in hypovolaemic subjects; rehydration should precede acepromazine administration. In some dogs, particularly Boxers and other short-nosed breeds, spontaneous fainting or syncope may occur, due to sinoatrial block caused by excessive vagal tone, and an attack may be precipitated by acepromazine, so a low dose should be used. Where there is a history of this type of syncope, or if it is suspected because of excessive sinus arrhythmia, it may be advantageous to control the dysrhythmia with atropine given just before the acepromazine. Large breeds: it has been noted that large breeds of dog are particularly sensitive to acepromazine and the minimum dose possible should be used in these breeds. In the event of accidental ingestion seek medical advice, showing the package leaflet to the physician. See section above, Special precautions for use. No formal studies on the safety of ACP Tablets in pregnant animals have been conducted (see Contraindications section). Acepromazine is additive to the actions of other depressants and will potentiate general anaesthesia (see indications for use section). 0.25 - 3 mg per kg bodyweight by oral administration. Onset of effects will be observed after 10 - 15 minutes. Normally single doses of acepromazine are administered (see Contraindications section). Transient dose‑dependent hypotension may occur in cases of accidental overdose. Therapy should consist of discontinuing any other hypotensive treatment, supportive care such as intravenous infusion of warm isotonic saline to correct hypotension and close monitoring. Epinephrine (adrenaline) is contra-indicated in the treatment of acute hypotension produced by overdosage of acepromazine maleate, since further depression of systemic blood pressure can result. Acepromazine is a phenothiazine. It is a central nervous system depressant with associated activity on the autonomic system. Phenothiazines have a central action due to inhibition of dopamine pathways, resulting in alteration of mood, reduction in fear and removal of learned or conditioned responses. Acepromazine possesses anti-emetic, anti-convulsant, hypothermic, hypotensive and anti-spasmodic properties, and shows a marked potentiating effect on barbiturate anaesthesia. The length of action of acepromazine appears to be prolonged and to be dose dependent. Shelf life of veterinary medicinal product as packaged for sale: 4 years. White opaque polypropylene tub with a white opaque low density polyethylene lid, containing 500 tablets. Anaesthetic Premedication: Following acepromazine administration, the amount of anaesthetic necessary to induce anaesthesia is considerably reduced. This reduction is approximately one-third of a suitable induction agent. Tranquilisation: Acepromazine tranquilisation (ataraxy) involves a modification of temperament which is not associated with hypnosis, narcosis or marked sedation. This is achieved with low doses of acepromazine. Subcutaneous injection is non-irritant and efficacious, especially in cats. Acepromazine is hypotensive. Particular care should therefore be taken in hypovolaemic animals; rehydration should precede acepromazine administration. In some dogs, particularly Boxers and other short-nosed breeds, spontaneous fainting or syncope may occur due to sinoatrial block caused by excessive vagal tone. An attack may be precipitated by an injection of acepromazine, so a low dose should be used. Where there is a history of this type of syncope, or if it is suspected because of excessive sinus arrhythmia, it may be advantageous to control the dysrhythmia with atropine given just before the acepromazine. Care should be taken when handling and administering this product to avoid exposure. Take precautions to avoid accidental injection or self-administration of this potent drug. In case of accidental self-injection, seek medical advice immediately and show the package leaflet or the label to the physician. Symptomatic treatment may be required. Avoid contact with eyes. If accidental eye contact occurs, flush gently with fresh running water for 15 minutes and seek medical advice if any irritation persists. In the event of accidental skin contact, was the contaminated with large amounts of soap and water. Medical advice should be sought if irritation persists. Cardiac dysrhythmia may follow rapid intravenous injection. See section, Special precautions for use in animals. No formal studies on the safety of ACP Injection in pregnant animals have been conducted (see Contraindications section). Premedication: 0.03 - 0.125 mg per kg bodyweight by intramuscular, subcutaneous or slow intravenous injection. Other uses: By intramuscular or subcutaneous injection 0.0625 - 0.125 mg per kg bodyweight. Approximately equivalent to 0.625 - 1.25 ml of 2 mg/ml injection per 20 kg bodyweight. By intravenous injection - as for intramuscular, except that it is recommended the injection is made slowly. The maximum dose that should be given is 4 mg acepromazine per animal. Normally single doses of acepromazine are administered (see section Contraindications section). Take adequate precautions to maintain sterility. Avoid the introduction of contamination during use. Should any apparent growth or discolouration occur, discard the product. Acepromazine possesses anti-emetic, hypothermic, hypotensive and anti-spasmodic properties and shows a marked potentiating effect on barbiturate anaesthesia. Shelf life after opening of the immediate packaging: 28 days. Do not store above 25°C. Protect from light. Following withdrawal of the first dose, use remainder of the product within 28 days. Discard unused material. 20 ml clear glass (Type II) vial, closed with a grey chlorobutyl rubber bung and aluminium crimped seal. Below are some recent questions we've received regarding ACP for Dogs and Cats, including answers from our team. ACP is ACP, so either formulation should work if they are given at an appropriate dose etc. 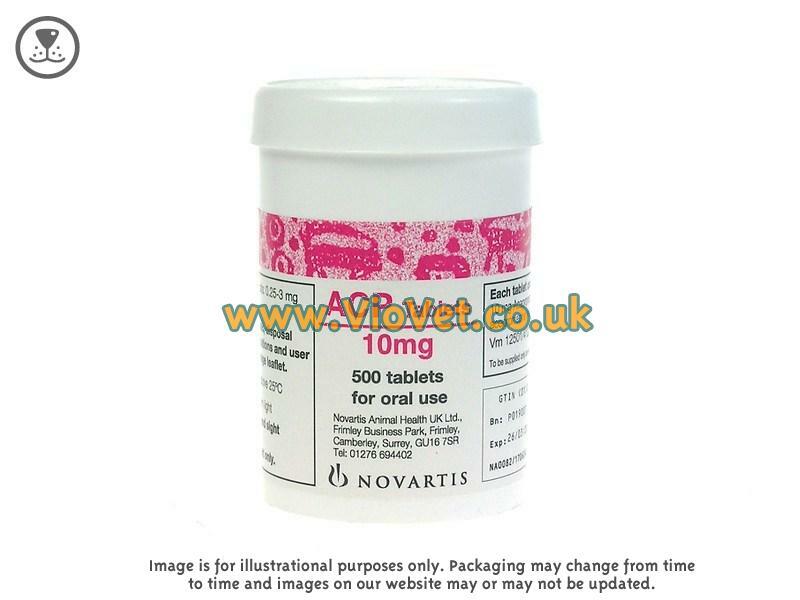 However vets are supposed only to prescribe licensed medication and the tablets are licensed for dogs and cats. In the past they were often used for horses but when the gel was introduced and licensed for horses, this became the automatic "correct" treatment. It is up to your vet if they want to prescribe an unlicensed drug. You can ask them - they might feel able to do so if you have a good reason, but they are in a difficult position legally. We are able to supply whatever has been prescribed, but nothing else. Is there any medical conditions in a cat that would make ACP a risky choice for sedation? ACP is generally very safe as long as it is not over-dosed. Your vet should ensure it is safe before prescribing ACP knowing your individual cat. ACP for cage rest cats? My cat was run over a fortnight ago. He has a broken pelvis. Cage rest was fine for the first 4 days now he's going mad. He climbed the inside of his cage and fell and is now walking oddly (appointment made with vet). He won't rest! I was wondering if ACP is compatible for use alongside metacam? Mostly for night time (when he fell) and when we're having to go to work (to pay the vet bills) because he's going to do himself a mischief. ACP might help, you will need to check with your vet about this. It is not a great plan to be used for weeks though. Sometimes confining a cat to one room in the house works OK and it is remarkable how well most cases of fractured pelvis heal, despite what cats do. You will need to discuss this with your vet and make a plan with him/her. When I moved into my house last March, the house came with 4 sheep. As the new spring approaches, it's coming time to shear them. Would this work to sedate sheep long enough to keep them calm for shearing? They're very scared of people. Hoping this would make them calm. Would it? ACP does have an effect in sheep, but can be unpredictable in very nervous sheep and may seem ineffective, even with quite a large dose.It is prescription only anyway, so your vet would have to write out a prescription for what they feel would be effective. Xylazine (Rompun) would be many vets' choice for this job. We could get some for you if you send us a prescription. Hi there. I am wishing to purchase a dog sedative. My dog is a very anxious one which is very nervous in crowded situations. I get married Saturday and I am concerned that he will be very distressed on the day. Medication like this has to be prescribed by your vet and has to be used with care, so we will not be able to help in this instance. Possibly your dog could be looked after elsewhere for the day? ACP does seem to be very safe, but it is not usually given every day for years.They might well not work so well after a while. There are quite a few herbal products which are intended to be used for the same thing and they appear very effective for some dogs, though not all. I would suggest trying a few alternative products so that you are not using the same thing all the time. If you hover your cursor over "Dogs" on the website menu, then click on the field labeled Behaviour & Brain, there are a lot of alternative products you could try. Zylkene works very well for some dogs, or Calmex seems to be popular. Adaptil works well for some too. Valerian compound is a very traditional treatment and still sells well too. Lots to choose from! Long-term use of ACP is not recommended. Your dog might tend to become tolerant to the medication, and after a while it might start to have unexpected or adverse effects. There are herbal treatments which work well for some dogs, such as Dorwest Scullcap and Valerian tablets, which appear to be very safe. Zylkene tablets will have a calming effect on some dogs, though these are more expensive. At just 6 months old, we would recommend getting advice from a qualified and experienced behaviourist, who will almost certainly have some good advice which would be worth following. This is much more likely to work well long-term than relying on medication. You could contact the Association of Pet Behaviour Counsellors at www.apbc.org.uk for the best advice. We have heard of many surprisingly good responses from this approach. Is it safe to give my dog ACP which was purchased 6 years ago. It might or might not be, it is impossible to know. Storage conditions, amongst other factors, can have a big effect. Therefore we would have to advise not to do it.